LONCON II, the 1965 World Science-Fiction Convention, took place over the 27th/30th August weekend in what SKYRACK editor Ron Bennett described as "the plush and highly priced (£5 for a bottle of gin) surroundings of the Mount Royal Hotel, Marble Arch, London, Some 350 delegates from many different countries attended the gathering, only the second to be held outside the North American continent." 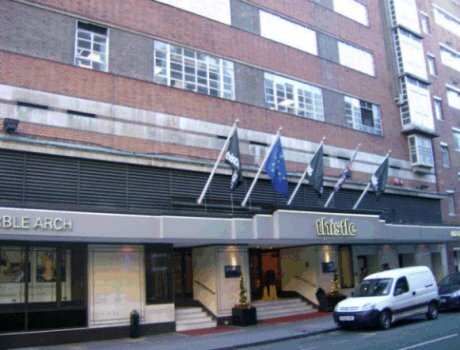 The first was of course the 1957 Worldcon which had also been held in London, at a hotel barely a mile away from this one. It was a very hot weekend and, as per this overheard snippet reported by Ron - "I don't know whether or not this is the best convention I've ever attended, but it certainly is the hottest!" - such air conditioning as the hotel possessed was not adequate to the task. This can be quite clearly seen in the sheen of sweat on the faces of those in several photos. In August 1965, Lyndon Johnson was in the White House, Harold Wilson was in 10 Downing Street, and the Vietnam War was being fought. While LONCON II was happening, the Gemini II capsule was orbiting the Earth. This was also the weekend the Bob Dylan album 'Highway 61 Revisited' was released, while Sonny & Cher's "I Got You Babe" was topping the singles chart in the US, a position held here in the UK by the Rolling Stones' "(I Can't Get No) Satisfaction". The following report has been edited together from those written by Ron Bennett, Terry Carr, and Ted White, with additional material primarily from those by Ethel Lindsay, Pete Graham and Frank Dietz in an effort to give as complete a picture of the convention as possible. My own notes and bridging pieces are in italics. Source notes and acknowledgements can be found here. The photos presented here come from a variety of sources. The collection a given photo is from is noted in parentheses thus: (sn) Stan Nicholls, (ns) Norman Shorrock, (tf) Ted Forsyth, (kf) Keith Freeman, (ts) Tom Schluck, (pm) Peter Mabey, (ejc) Ted Carnell, (cc) Carol Carr, (br) Bill Rotsler, (avc) Vince Clarke. As always, a tip of the hat to Peter Weston for identifying many of the people in these photos and for supplying scans of them in the first place. Here are links to pages devoted to the individual days and also to 'sidebar' material connected with the convention. As well as the photos illustrating the report, a number of others have been grouped tiogether in 'galleries' that can be accessed from links in the main report. There was nothing to indicate which night the two room parties represented by two of those galleries actually took place, so these have been arbitrarily assigned to those nights where they appear in the report. The following prologue has been assembled from letters to Arthur 'ATom' Thomson, who was at that time the European Administrator of TAFF, the Trans-Atlantic Fan Fund. Terry Carr had recently won the US-to-UK race to be the TAFF delegate to LONCON II and would be travelling to the convention under the auspices of the fund, accompanied by his wife, Carol. Ron (Ellik) and I are laying plans far Europe next summer. I'll be catching the Charter Plane which the Teachers' Union is running here in LA at 4:00 pm next June 18, and getting into London sometime the 19th. I plan on spending a week in England before going over to meet Ron on the continent. He plans to boat into Bremerhaven about the 27th (unless he decides to go on the Yugoslav freighter with Poul and Karen Anderson), where he'll pick up a new VW, and we'll start off on our continental tour, getting back to England about a week before the con. I have an idea there are going to be one hell of a lot of Americans over there. A letter from Charlie Brown says that the del Reys, Pohls, Silverbergs, Blishes, Jock Root and Charlie and Marsha are all making plans. Even without the charter plane it looks like a much bigger US attendance at London this time than in '57. So we've shifted to Alternate Plan B, on which we've been working all along in case the charter flight fell through Actually, this other plan is much better than the one we'd have had to follow if the charter flight had gone across since that flight was to arrive in London the day before the con and we would have missed all the pre-con festivities. Plus the fact that it would have wasted time by necessitating a side-trip to Paris, return to London, then a different trip to Ireland and back. We've now arranged it so that we fly directly to Paris, return from there to London before the con, stay through the con, then go to Liverpool and Belfast and leave from Shannon Airport. Orderly Progression Westward, I call it. It's a very neat schedule, and the only thing wrong with it is that it's costing us about $250 more than the charter flight schedule would have. But, oh well. The schedule: Wednesday, Aug. 18th, we leave New York in the evening and arrive in Paris the next morning. There we connect up with Boyd Raeburn and, hopefully, Ron Ellik and Al Lewis; we spend the weekend and Monday seeing Paris and environs (Boyd has made a few noises about a quick trip to Switzerland to visit Versins, (Pierre, presumably) but I doubt we'll be able to manage this), then on Tuesday the 24th we go to London, probably arriving there that evening. We'll be in London through the con and for a day thereafter - the Tuesday right after the con being listed in our schedule as "Rest." On Wednesday, Sept. 1, we take off for Liverpool, probably arriving there that evening. We stay the night, then leave for Belfast either the next day, Thursday, or the following one, Friday - depending on how things are going then. From what Ron and others have told me, I expect we'll be there the two days. Anyway, we'll be off for Belfast by the weekend, there to stay with the Willises. Our flight from Shannon Airport is on Wednesday Sept. 8. So there you are. You asked when Don (Wollheim) will be getting there. Well Don's away on a week's vacation right now, so I can't ask for full information, but his secretary says he's taking one week at the end of August for the convention. Presumably he'll leave here about the weekend of August 22; in any case you can figure on him being around somewhere the week before the con. He'll be returning to New York a day or two after the con. You also asked who else will be coming and who won't; that's a difficult question. The failing of the charter flight may cause a number of people to miss the con who would otherwise have gone, so far I do not know about this. I do know that Charlie and Marsha Brown will not be going over. Lester & Evelyn del Rey won't be going either - they'd planned on it, but Lester has a blood condition which makes it inadvisible for him to have any kind of vaccination, even such an otherwise mild one as smallpox, so he's unable to leave the country and get back in again. Ted White is going - though right now, with the charter flight having just fallen through, he's without reservations on any flight. He hopes to follow our itinerary in Paris and London and possibly Belfast, but all this depends on flight plans. Pete Graham is also definitely coming over, but he won't be at the con. He has a charter flight getting him to London about the 8th of August, and he wants to bicycle around in Wales, then go on to Ireland and meet up with us in Belfast; after we go back home he'll return to London by bicycle, catching his return flight back ~ around the 12th of September. This kind of itinerary would make it inconvenient as hell to return to London right in the middle of the trip for the con, so he's decided to be more tourist than fan on this trip. He'll probably be looking you up when he's in London, though... either at the beginning or end of his trip. I don't know about other people...oh yes, Bob Silverberg told me he and Barbara are going over on about the 12th of August, returning right after the con. Dave Kyle will of course be there...wearing bulletproof armor, no doubt. Carol and I began by flying to Paris, where we rendezvoused with Ron Ellik, Al Lewis, Boyd Raeburn, and Lois Lavender, who'd been touring France for a couple of weeks already; we spent several days touristing around Paris with them, visiting the Louvre and so forth. One night we visited a three-star restaurant and I had my first taste of meurseault, a white wine that I loved even though I still can't spell it. Afterward, we repaired to Carol's and my room to drink a bottle that Ron had bought earlier, but when he tried to open it using a device that pops out the cork by injecting gas beneath it, the whole bottle broke and we had to end the evening early. Thence we went to London by train, passing through many fields of French produce, mostly grapes, though I was pleased when we stopped at Amiens, where Jules Verne's tomb is, according to what I've read in ancient Gernsback magazines. We didn't have time to get out and look, though; we continued to the French coast and took a boat to the white cliffs of Dover, which really are, and thence went by train to London, where Carol and I stayed with Arthur and Olive Thomson for a day or two and Arthur showed us around London; we went on a trip on the Thames, for instance, and I remember Arthur's marvelous impression of a cockney's directions around London: 'You take the Firty-free bus,' etc. That night there was a small party at Ethel Lindsay's place where Ron Ellik said many hilarious things none of which I remember, and Arthur did the same with ditto memory results, and we heard lots of gossip about then current London fan politics, all of which I forgot almost immediately. It was hilarious, though, I assure you. We touched down on a rather empty and disused-looking strip, and taxied up near a terminal building, Then the pilot's voice came over the pa. "It is fifty degrees..." he said. It was about seven o'clock. I was wearing a light summer suit, although I had a wool suit in my luggage. My hair was short almost to the point of baldness. I shivered in anticipation. We had to walk across the strip and past several parked planes to the terminal. The facilities seemed very primitive in contrast to Kennedy, although I noted signs of construction, and it appeared modernization was underway. We climbed a flight of stairs, claimed our luggage, went through a brief customs inspection, and I was at last setting foot to English soil. I found the bus to the London BOAC terminal, and boarded it. The English are fresh air fiends, and the bus driver was very much one. It might be only fifty degrees outside, and his passengers might all be from sub-tropical New York, but he was not to be dissuaded. He opened his driver's window, and the sunroof was opened up at the front so as to channel a direct blast of frigid air into the vehicle. I believe that it was at this point that I first began my flirtation with the cold which was to plague me intermittently for the duration of my trip. The bus was very underpowered, and later I was told that it had never been intended to exceed 30 mph. This is understandable, since there are apparently few opportunities for any vehicle to exceed this speed in or near London. By some stroke of luck, a "motorway", or expressway, M4, has been built between London and its airport, however, and this gave our driver the chance to demonstrate first-hand his rudeness to other drivers at speed. At the BOAC terminal I called the Mount Royal Hotel, at which I had no reservation, and reserved a room, which I was told would be ready that afternoon. I asked how I might get there from the terminal, since I wanted to try out the Underground map I'd received with my third progress report, and was advised to take a taxi. I did, but actually there was an easy and direct route by Underground, had I but known. The Mount Royal has an efficient system. My luggage was snapped up As it hit the sidewalk, and I was given a plastic card with a number on it. I had only to turn it in when I had the room and wanted the luggage. This was fine in theory, but I wanted a heavier jacket, and had to forego the pleasure for the time being. 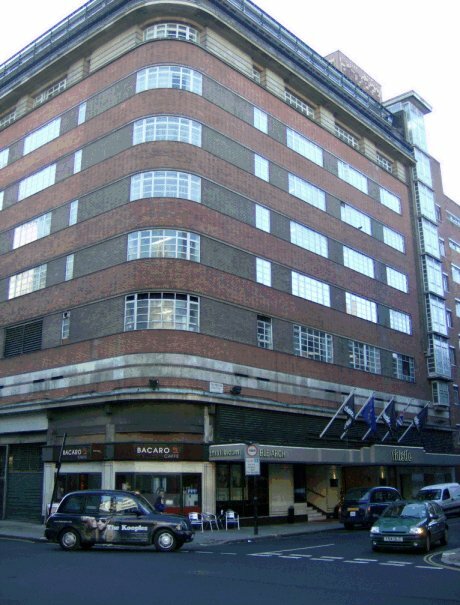 The hotel occupied an entire block near Marble Arch, at the northeast corner of Hyde Park. Its entrance is not on the main street, Oxford St., but rather on the back side, where there is less traffic to interfere with the taxis, which, due to their very sharp turning radius, execute U-turns almost anywhere and everywhere. The entrance is inconspicuous for such an expensive hotel (I'm told it was previously an apartment building of some sort), and one immediately takes an escalator to the second floor lobby. There I registered, and was told there would be no room available until eleven or twelve. It was then eight-thirty. Plastic luggage check in my pocket, I left again, heading for the Underground Station. I had no specific goals in mind; I simply wanted to kill time. I was tired and chilled, although the day was warming already, and might become a balmy 65 by early afternoon. But I am a subway fan, and I thirsted to ride my first foreign subway. I descended into the Marble Arch station. It was an enjoyable exploration, although woefully incomplete, and the best I was to manage during my stay in London. I would've enjoyed it more if the motorman's cab didn't block all foreword view, and if I hadn't been so tired. I was exhausted; I'd been up for over twenty-four hours with only an hour or two of naps on the plane. My body requires nine hours a night, and it was protesting. Back at the hotel, my room was still not ready. I sat down and picked up a Paris edition of the Herald-Trib and started reading it. I'd gotten most of the way through it when two familiar faces appeared nearby. It was Fred Pohl and Harry Harrison, With them, and I was ashamed for not recognizing him, was Ted Carnell. Ted and Fred were off for lunch, but Harry and I talked for a bit. 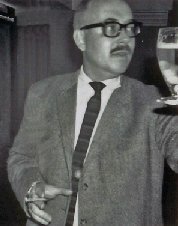 He suggested I accompany him to the local hairdressers while he got a haircut, and after that we retired briefly to a pub, where F&SF treated him to half a pint, and I learned the mistake in ordering a drink like a whiskey sour. Not even Harry could tell what had been put into it. I drank most of it before giving it up as a bad job. Back at the hotel again, it was twelve-thirty and my room was ready. I bid goodbye to Harry, said I'd see him at Brunner's party that night, went up to my room, 773, and sacked out. I slept till eight that evening. After dressing and shaving, I made my first use of the local telephone service. I called John Brunner. I'd received a note from John a month earlier, inviting me to the party at his place that evening if I was in town. Now I wanted directions. English phone service is famed in song and story for its wretchedness, but what bothered me was the antiquated phones in the hotel rooms. The modern pay phones were not bad, but the handsets on the room phones were cleverly designed to magnify hollow echoes in such a way that every connection sounded terrible. "What Underground connection do I take to your place, John?" I asked. "Oh, don't bother with the Underground," John said. "Use a bus. A number thirteen or one-thirteen." "Time you were," John said warmly. "You'll find the stop right outside the hotel. It's very fast, very direct. Just take the bus to the Finchley Road tube station, and Frognal is just 500 yards on." It is a sad commentary on my still befuddled condition that I did not tumble to that destination until I got there. The Finchley Road tube station indeed! I could've taken the Central Line a couple stops east to the Oxford Circus station, transferred to the Bakerloo Line, and taken it north directly to the same station! But I didn't, and perhaps it's just as well. Because this was to be my only venture with an omnibus, one of London's famed double-decker busses. Five hundred yards doesn't seem like much to me, and for some reason I couldn't find Frognal. If John had said "up two blocks and on your right" I'd have been in better shape. As it was, I collared every pedestrian without luck, and finally stumbled onto Frognal by accident. It crosses Finchley Road, but on the other side it is called something else. 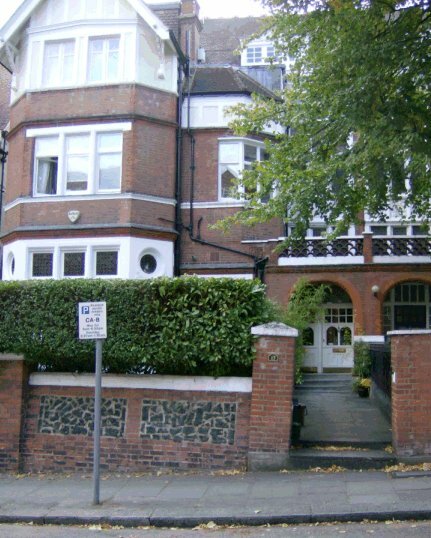 The Brunner home, 17 Frognal, in 2011. They lived in flat 'd'. The Brunners have a handsome flat into which they'd only moved this year. John told us he'd done most of the redecorating himself, and that most of the furniture in his office-den - desk, chairs, files, carpet - were leased. It was cheaper than purchasing them. 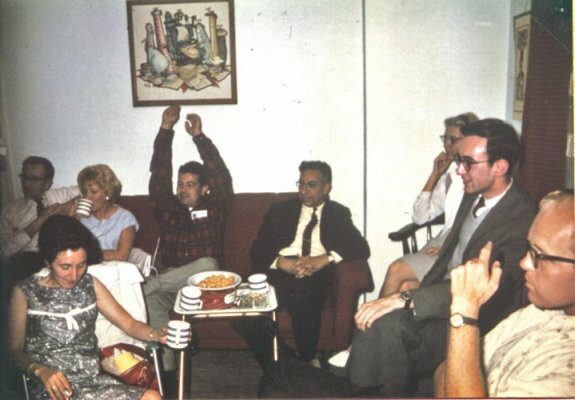 The party seemed to be made up of two disparate groups: the science fiction people, a large preponderance of whom were American, and friends and acquaintances of John's from the mundane world and publishing industry. There was very little cross-communication. At one point I overheard a woman asking a young man, "Are you one of those science fiction people?" "No," she replied, and immediately they fell into a lengthy conversation. The first people I saw that I knew, aside from John himself, ware the Silverbergs, who were chatting with Don Wollheim. I joined them, and after a spell the Pohls and Betty Ballantine came in. I chatted with Betty for fifteen or twenty minutes; this was the first time I'd met her. John joined us far a spell, and introduced us to a tall, cadaverous- looking man who was a Scientologist, and we discussed the pros and cons of hypnotism, which Scientology is rather strongly opposed to. My own feelings are by no means that strong, but I've had reservations about hypnotism. John on the other hand was rather enthusiastic about it. But too quickly more guests had arrived and he was back to his duties as host. Then a new party arrived, and it was Arthur and Olive Thomson, Boyd Raeburn and the Carrs. I joined them in the kitchen for drinks. I'd helped exhaust the cider and was now trying a mild wine. I was all too aware that my metabolism was not yet in harmony with the time or place, and I'd best go slow and easy. Don Wollheim was in the kitchen too, and he, Terry and I were confronted by a woman with flaming red hair. "You're Americans, aren't you?" she asked. We nodded, "What is your feeling about Americans?" I asked, feeding her the straight line. "Well...let's just say that my politics lean towards the left," she said coyly. "You don't care for us being in Vietnam?" "I'm not going to say that word, my feelings are so strong," she said. We chuckled, and she added, "You Americans. You're very different from us. You've much more in common with the Russians, you know." "Yes," I replied, ever witty, "One of these days we and the Russians are going to blow up the world." That rather slowed things down for a moment, although Don and Terry nodded emphatically. The conversation turned to the Carrs' trip with Boyd through France. "Isn't it a wonderful place, Paris?" the redhead asked. "You were in Paris?" "Yes," said Terry. "Lovely buildings, beautiful city." "I'm a real Francophile," she said. "It's so wonderful over there." "Food's nice too," Terry said, nodding. "Well, I think it's a lovely, wonderful place," she said. Food, canapes, were served in the front room. The table upon which they wore laid out was in the darkest corner of the underilluminated room, and Carol Carr came up to me after a moment and said, "It's terrible; I'm so embarrassed." "What happened?" I asked, peering through the murk and trying to see if there was anything I wanted to try. "You see those little balls of things in that dish there?" "Yes," I peered at them nearsightedly. "I thought they were cheese, you know? And I picked one up and put it in my mouth. And it was butter." "Oh," I said, moving my hand back from the dish. A moment later, by the door, I found a light switch, and turned it on. Boyd and I got into a conversation about rock and roll. He.d been on a buying binge, and had over forty records he'd bought in France. He told me about any number of fabulous people whose names I'd never heard before and don't remember now. "You're becoming a moldy fig, Boyd," I told him. "You haven't cared much far jazz for the last six, seven years." "That's true." His eyes lit up. "Beat music, that's what's happening, baby,"
The party broke up around midnight, there being a midnight curfew on all public transportation. Arthur gave me a lift back to the hotel with Boyd, and I went back to bed and to sleep again, my first day in England over.